I recently ran up on this oversized denim jacket hiding in the coat closet in my house. To be honest, I have no idea whose it is. I've asked everyone in my family, yet no one knows... A little strange, if you ask me. Needless to say, I have now taken it under my wing and claimed full ownership of this incredible piece. I love the classic blue of the denim, as well as the dramatic slouch in the back. I paired it with a mini-dress over my leather joggers. 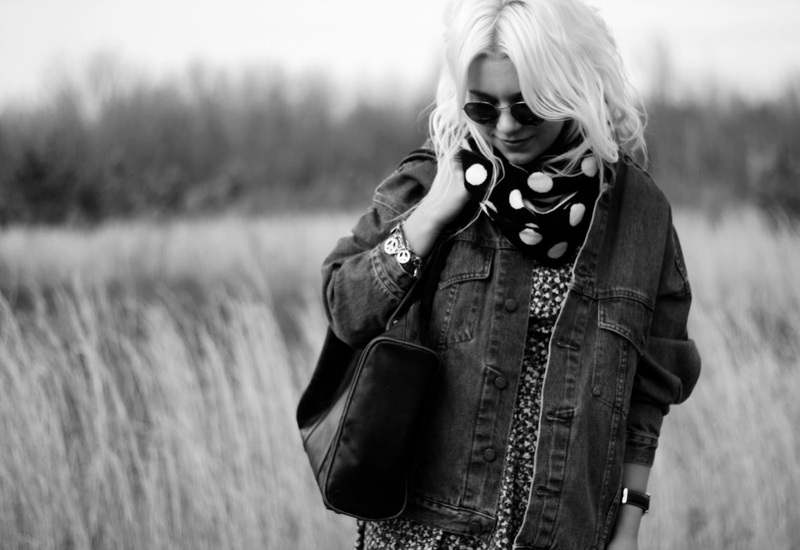 To throw in a little mix of prints, I added a black and white polka dot scarf. And for a little bit of an unexpected touch, I added a pair of feminine Mary Jane heels. Very cool! You combined the denim very original, perfect! The jacket looks great and I love your bag!